Wow – what a definitive book – more about Reconstruction and that era than I really thought I ever wanted to know. It’s good though – thorough – very good. The only downside is that it reads like a textbook but if that doesn’t bother you I’d say go for it! I was always more interested in the other issues of the post-Civil War era – the Gilded Age, Westward expansion, the Women’s movement – but right in the middle of all of that was Reconstruction and the Revolution that wanted to be but never could quite get there. Starting in 1863 with the Emancipation Proclamation Foner tracks the issue of slavery and labor and politics and industrialization and socio-economic struggle through the eyes of the ex-slaves, northern industrialists, Southern plantation owners, black black freemen (prior to the revolution). He covers an enormous amount of territory. Many good things did happen during Reconstruction, schools were mandated, public health – Reconstruction is great social history. The trouble is that it’s so complex and the changes in politics are so fundamental that what started out as a dream of integrated Reconstruction South, ended with a Redemption South, “redeeming” the white man’s south from the blacks through coercion, trickery, fraud, violence and whatever means necessary. A tragic turn about because suddenly, after the immediacy of militarily enforced freedom and the passage of key legislation, the North believed in States’ Rights for enforcement. Foner is detailed. The various states progress and regression is noted as well as broader and narrower geographical areas. He provides a very large number of biographies and individual endeavors by blacks, whites, Southerners, Northerners, women, everyone – how New Orleans was a bit different and South Carolina had its own ways – like that. Over the years Reconstruction has been regarded as a blessing and a curse, a promise and a nightmare. Foner doesn’t do that – he presents a revisionist view, looking at the era with a more nuanced eye attuned to the accomplishment of blacks as well as whites, the idealists as well as the reactionaries, the gains as well as the losses. It’s pretty well balanced presentation – but the final score does not show a win or a draw for this country. We lost. 1. 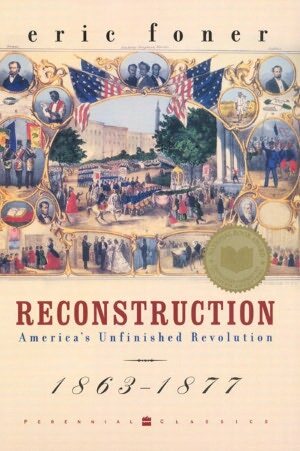 In what ways was Reconstruction a success? A failure? Explain. 2. Some historians have suggested that had Lincoln not been assassinated, Radical Republicans in the House might have impeached him instead of Andrew Johnson. Defend this argument.